Historically, sheep-raising was one of the oldest introduced agricultural pursuits in Hawai‘i. Sheep were originally introduced to the Big Island by Capt. George Vancouver in 1793, when he left two ewes and a ram at Kealakekua. Sheep were being raised for export by 1809 and flourished through the early part of the 20th century. Most meat was consumed locally and wool was supplied to mainland US buyers. Wool production reached its peak in 1875 when 565,000-pounds were sent overseas. A visible remnant of the sheep industry is the Humu‘ula Sheep Station, situated at the junction of Saddle Road and Mauna Kea Access Road on the lower slopes of Mauna Kea. The Sheep Station has historical and architectural interest because sheep raising, although never a major industry, was carried on until the last large flock in the Islands, located at Humu’ula, was phased-out in the early 1960s. The Humu‘uIa Sheep Station Company chartered by the Hawaiian Government in 1883, was an operation of H. Hackfeld and Company. Ownership of the station then came under Parker Ranch and operations continued for years, often little known by Hawai’i residents due to its comparatively isolated location. Sheep raising at Humu‘uIa was given‐up in 1963 and although abandoned as a sheep station, cattle ranch support activities continued until 2002, when the Parker lease expired. The Sheep Station site contains a mix of structures and artifacts with varying degrees of historic, architectural and aesthetic significance. Existing structures include offices, living facilities, outbuildings, work sheds, shearing sheds, holding pens and catchment facilities. Buildings and artifacts tell an interesting architectural story and provide a historic backdrop for a contemporary rustic experience. The site was assessed by the State Historic Preservation Division for placement on the Hawai’i Register of Historic Places. The main historic building on site consists of an office and dwelling which was part of a cluster that represents the property’s rustic character. It was originally built as a men’s living cottage and, over time, converted to office and residential use. The structure was built in stages and consists of two distinct wings, both with gable roofs. The 1973 SHPD assessment refers to the elaborate decoration of the living room with skylight, wainscoting and carved scrollwork. Unfortunately, the building has deteriorated from neglect and lack of maintenance. A preliminary architectural inspection indicates that the building will require extensive structural rehabilitation to meet current health and safety standards for occupancy. The good news is DHHL, owner of the site, adopted the ‘Āina Mauna Legacy Program. One of the actions called for in that Plan and its accompanying Environmental Assessment is the restoration and adaptive reuse of the Humu‘ula Sheep Station. We are honored and proud to have prepared the ʻĀina Mauna Legacy Program planning document, Implementation Strategy and Work Plan, Cultural Impact Assessment and Environmental Assessment for DHHL. We are equally proud the ʻĀina Mauna Legacy Program was unanimously approved by the Hawaiian Homes Commission and was given the “Environment/Preservation Award” from the American Planning Association‐Hawaiʻi Chapter and the “Koa: Standing the Test of Time Award” by the Hawaiʻi Department of Agriculture and the Hawaiʻi Forest Industry Association. In 1920, Prince Jonah Kūhiō Kalanianaʻole, Hawai‘i’s Republican delegate to Congress, drafted the Hawaiian Homes Commission Act. In 1921, the federal government of the United States set aside as Hawaiian Homelands approximately 200,000‐acres in the Territory of Hawai‘i as a land trust for homesteading by native Hawaiians. The avowed purpose of the Hawaiian Homes Commission Act was returning native Hawaiians to the land in order to maintain traditional ties to the land. The Hawai‘i State Legislature in 1960 created the Department of Hawaiian Home Lands (DHHL) for the purposes of administering the Hawaiian home lands program and managing the Hawaiian home lands trust. The Department provides direct benefits to native Hawaiians in the form of homestead leases for residential, agricultural, or pastoral purposes. The intent of the homesteading program is to provide for economic self‐sufficiency of native Hawaiians through the provision of land. Prince Kūhiō died at the age of 50, on January 7, 1922. Six months after his passing, the first Hawaiian homesteaders would move to what was referred to as the Kalanianaʻole Colony (sometimes called Kalanianaʻole Settlement) on Molokai. Twenty-three lots of approximately 25-acres each, adjoined by 2,000-acres of community pasture were carved out. Later residential lots were added. The first eight Hawaiians and their families which were selected by the commission to go to the ‘āina ho‘opulapula at Kalamaula Kai were: David K Kamai, Clarence K Kinney, Albert Kahinu, WA Aki, John Puaa, Harry Apo, George W Maioho and William Kamakaua. “Of these eight families, only three will go first, because only three of the lots have been so far cleared by the commission to be farmed at once, and thereafter, other families will go when their lots are ready.” (Kuokoa, August 17, 1922) Kamai was the first. Dubbed the Four Horsemen, Kuhio, Rev Stephen Langhern Desha, Sr, John Carey Lane and Henry Lincoln Holstein had their pictures taken so Kuhio could show to his fellow congressmen at Washington his backers that brought up this important matter for rehabilitating its people. Later other friends joined, and they were John H Wise, Noa Aluli, Akaiko Akana, Emil Muller, Attorney CK Breckons, and several others, and they planned to first pass the measure in the local legislature. Rev Stephen Langhern Desha, Sr had an unusual combination of ministry of the gospel, service in legislative bodies and publisher of a newspaper. He was behind the ‘Desha Bathing Suit Law,’ requiring all over 14 to cover up ‘at least to the knees,’ or be fined. John Carey Lane was a member of the territorial senate from 1905 to 1907 and introduced the bill establishing the City and County of Honolulu. He was elected by an overwhelming majority to serve as Mayor of Honolulu from 1915 to 1917. Henry Lincoln Holstein served in the Senate of the Republic of Hawaiʻi from 1896 to 1898 and later as Speaker of the House in the House of Representatives of the Territorial legislature. Holstein served as the executor of Queen Liliʻuokalani’s estate. Passed by Congress and signed into law by President Warren Harding on July 9, 1921, the HHCA provides for the rehabilitation of the native Hawaiian people through a government-sponsored homesteading program. Native Hawaiians are defined as individuals having at least 50 percent Hawaiian blood. DHHL provides direct benefits to native Hawaiians in the form of 99-year homestead leases at an annual rental of $1. In 1990, the Legislature authorized the Department to extend leases for an aggregate term not to exceed 199 years. Homestead leases are for residential, agricultural or pastoral purposes. Aquacultural leases are also authorized, but none have been awarded to date. The intent of the homesteading program is to provide for economic self-sufficiency of native Hawaiians through the provision of land. Other benefits provided by the HHCA include financial assistance through direct loans or loan guarantees for home construction, replacement, or repair, and for the development of farms and ranches; technical assistance to farmers and ranchers; and the operation of water systems. Hawaiians had consistently advocated for homesteading by Hawaiians since the Land Act of 1895 set up five methods of homesteading upon the former government and Crown lands by the general public. Hawaiians had applied for and received homestead lands, individually and through homestead associations. “Native Hawaiian” means any descendant of not less than one-half part of the blood of the races inhabiting the Hawaiian Islands previous to 1778. Approximately 200,000‐acres of land was set aside to the Hawaiian Homes Commission as a land trust for homesteading by native Hawaiians. The property and its program are administered by the Department of Hawaiian Home Lands. Pursuant to provisions of the Hawaiian Homes Commission Act (HHCA), the Department provides direct benefits to native Hawaiians in the form of ninety‐nine‐year homestead leases at an annual rental of $1. In 1990, the Legislature authorized the Department to extend leases for an aggregate term not to exceed 199 years (Act 305, Session Laws of Hawaiʻi 1990; section 208, HHCA). Homestead leases are for residential, agricultural, or pastoral purposes. Aquacultural leases are also authorized, but none has been awarded to date. The intent of the homesteading program is to provide for economic self‐sufficiency of native Hawaiians through the provision of land. You must be a native Hawaiian, defined as “any descendant of not less than one‐half part of the blood of the races inhabiting the Hawaiian Islands previous to 1778.” This means, you must have a blood quantum of at least 50 percent Hawaiian. This requirement remains unchanged since the HHCA’s passage in 1921. One residential lot and one pastoral lot. Eligible beneficiaries may not apply for all three types of homestead leases. Nor may they apply for both an agricultural lot and a pastoral lot. We prepared the ʻĀina Mauna Legacy Program (long‐range planning document,) its Implementation Work Plan and Environmental Assessment for approximately 56,000‐acres (about ¼-of all the DHHL lands in the Islands) of Hawaiian Homes Commission property on the Island of Hawaiʻi. To put the property’s size and shape in perspective, it is equivalent to an area on Oʻahu from Hawaiʻi Kai to Aloha Stadium (19-miles) and Aloha Tower to the Pali Lookout (6-miles). The ‘Āina Mauna Legacy Program is DHHL’s long‐range planning document geared to restore and protect approximately 56,000‐acres of native Hawaiian forest on Mauna Kea that is ecologically, culturally and economically self‐sustaining for the Hawaiian Home Lands Trust, its beneficiaries and the community. We were honored and proud when our planning document, the ‘Āina Mauna Legacy Program, received awards: the “Environment/Preservation Award” from the American Planning Association‐Hawai‘i Chapter and the “Koa: Standing the Test of Time Award” by the Hawai‘i Forest Industry Association. ʻĀina Mauna, or mountain lands, reflects a term used affectionately by elder Hawaiians to describe the upper regions of all mountain lands. Small cultivated areas were located primarily in the lowlands, which were extensively cleared for agriculture. Most permanent settlement initially was near the ocean and at sheltered beaches, which provided access to good fishing grounds, as well as facilitating convenient canoe travel. Koa tree canoe logs were cut from the ʻĀina Mauna; it is estimated that it takes up to 125-years or more to grow a koa tree large enough for a voyaging canoe. Traditional dwellings (hale pili) were constructed of native woods lashed together with cordage most often made from olonā. Pili grass was a preferred thatching. Lauhala (pandanus leaves) or ti leaf bundles, called pe‘a, were other covering materials used. In addition, implements incorporated into hula were made of wood and other forest products. Weapons used wood products for spears, daggers, clubs, shark tooth and other wooden weapons. With ‘Contact’ came changes to the ʻĀina Mauna. In 1778, Captain Cook left goats and pigs. In 1793, Captain George Vancouver gave Kamehameha cattle (which he placed a kapu on to allow herds to grow.) In 1803, American Richard Cleveland presented horses ‐ a stallion and a mare ‐ to Kamehameha. The goats, pigs and cattle started to have negative impacts on the Islands’ mauka lands. On top of that, ʻiliahi (sandalwood) became first recognized as a commercial product in Hawai‘i in 1791 by Captain Kendrick of the Lady Washington, when he instructed sailors to collect cargo of sandalwood. Trade in Hawaiian sandalwood began in the early-1790s; by 1805 it had become an important export item. Unfortunately, the harvesting of the trees was not sustainably managed (they cut whatever they could, they didn’t replant) and over-harvesting of ʻiliahi took place. By 1830, the trade in sandalwood had completely collapsed. Hawaiian forests were exhausted and sandalwood from India and other areas in the Pacific drove down the price in China and made the Hawaiian trade unprofitable. Through King Kamehameha III’s Act No. 2, Chapter III, Article I, Chapter VI, Section VII of April 27, 1846, ‘forestry’ began in Hawaiʻi. By the late-1800s, the sugar industry had been lobbying for forest protection, as the cattle grazing and denudation of upland forests threatened the water supply critical to sustaining the sugar economy. A lasting legacy of that era was the implementation of the Forest Reserve System, created by the Territorial Government of Hawai’i through Act 44 on April 25, 1903. That year, on May 13, 1903, the Territory of Hawaiʻi, with the backing of the Hawaiʻi Sugar Planters’ Association, established the Board of Commissioners of Agriculture and Forestry. (HDOA) By 1930, a million acres of land – nearly 25% of Hawaii’s land area – were in the Forest Reserve System. Forest reserves were useful for two primary purposes: water production for the Territory’s agricultural industries, and timber production to meet the growing demand for wood products. And, forests are not just about trees. Virtually all our fresh water comes from the forest, also clean air, recreation areas, habitat for native species, plants for cultural practices and woods for fine arts are among the thousands of forest benefits. Our forests present endless opportunities for both residents and visitors; Hawaii’s forests offer employment, recreation and resources – including ecological goods and services. Ecological goods include clean air, and abundant fresh water; while ecological services include purification of air and water, plant and wildlife habitat, maintenance of biodiversity, decomposition of wastes, soil and vegetation generation and renewal, groundwater recharge, greenhouse gas mitigation and aesthetically pleasing landscapes. Water, wildlife and wood are just a few of the products found in our forests. The ‘Āina Mauna Legacy Program is DHHL’s long‐range planning document geared to restore and protect approximately 56,000‐acres (about ¼-of all the DHHL lands in the Islands) of native Hawaiian forest on Mauna Kea that is ecologically, culturally and economically self‐sustaining for the Hawaiian Home Lands Trust, its beneficiaries and the community. We were honored and proud when our planning document, the ‘Āina Mauna Legacy Program, received awards: the “Environment/Preservation Award” from the American Planning Association‐Hawai‘i Chapter and the “Koa: Standing the Test of Time Award” by the Hawai‘i Forest Industry Association. 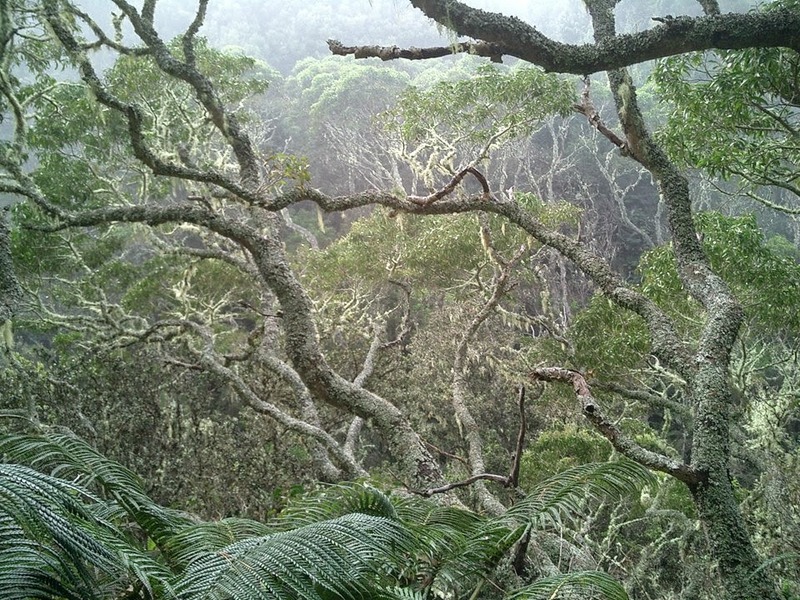 The image shows some forest of the ʻĀina Mauna.